A Community Foundation is a pool of charitable donations. This pool is invested and the interest earned is distributed to local charitable organizations. The principal is not touched, so the donations continue to grow, generating income to meet local needs for many years to come. Our Foundation is registered with the Canada Customs and Revenue Agency. It is governed by an appointed Board of Volunteers, who are knowledgeable about local needs and recognized for their financial stewardship and community leadership. 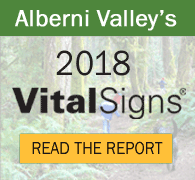 Assets will grow each year and the Foundation is then able to support local organizations serving youth, seniors, health, arts and culture as well as education, recreation and the environment within the Alberni Valley. Contact the Foundation to find out how you, your family, or your organization can help create lasting benefits for our Community. © 2019 Alberni Valley Community Foundation. Developed by Alberni Design.